My dissertation, entitled "Comparative topological analysis of neuronal arbors via sequence representation and alignment", is focused on applying bioinformatic approaches to neuronal morphology to enable new discoveries and increase understanding about how morphology and neuron function interrelate. Chapter 1: An outline of my dissertation. Neuronal morphology interacts with many other features of neurons and their networks. As more data becomes available through centralized curation of existing and new data through NeuroMorpho.Org, and as several fold increases of data production occur with development of high-throughput imaging and reconstruction techniques, new questions become possible. While chapter 2 provides background on the field of neuronal morphology, chapter 3 discusses an effort to aid in the development of automated reconstruction algorithms. Chapters 4 and 5 introduce techniques based on graph theory and genomics, starting with a representation of morphologies as sequences of branch features and followed by scalable analyses seeking representative morphological patterns that can allow for testing and refinement of functional and developmental hypotheses. Chapter 2: The second chapter provides a background into known relationships between morphology and function, particularly focused on but not limited to dendrites, as well as the various measurement, experimentation, and modeling methods that have been produced those findings. Chapter 3: A spotlight is directed at the problem of generating large amount of high quality neuronal reconstruction. While relying on microscopy and cellular visualization techniques, the task is arguably primarily a computer vision problem. Many different approaches are being studied, however all approaches need validation. This chapter discusses an algorithmic method of quantifying the quality of a reconstruction relative to a gold standard and compares this method with expert judgement. 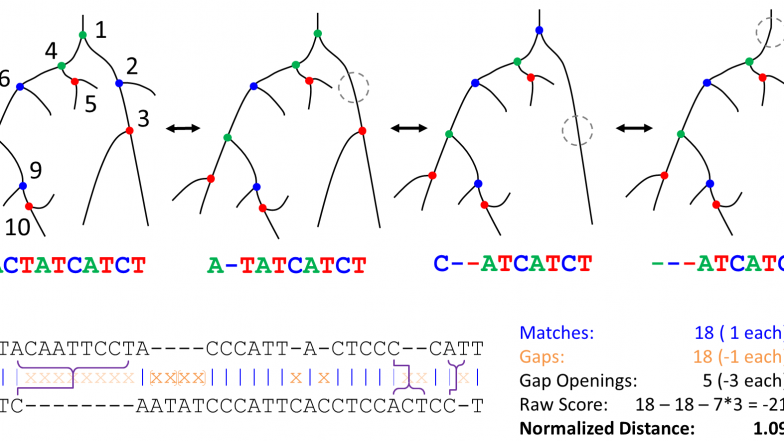 Chapter 4: The core novel component of the dissertation is the application to neuron morphology of sequence analysis techniques, previously applied to understanding genes, gene networks, and proteins. Neuronal morphology is driven by many factors, and it is as yet unclear whether specific branching patterns might provide a useful indication of particular cell type or contextual/environmental effects. A novel representation of neuronal morphology is presented along with a motif analysis of the representation. Chapter 5: Finally, the new sequence representation is used in a sequence alignment procedure in order to find what branching pattern relationships exist between neurons of various classes (by cell type, brain region, species, etc). It is shown that while standard topological morphometrics overlap substantially with the information derived from alignment of these neuronal sequences, the sequences do uniquely aid in distinguishing neuron types, and the prototypical structures of neuronal classes (seen through emergent clusters) can be used to form new hypotheses concerning structure and function. Additional detail regarding methods discussed in chapter 5.